Video shows the Democratic Institutions Minister telling a packed town hall that "people aren't clinging for change the way that they were under the former government." Maryam Monsef might want to rewrite her talking points. 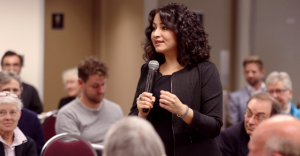 Last week, Canada’s Democratic Institutions Minister played down the “appetite” for change when she told an electoral reform town hall in Victoria, BC that their enthusiasm wasn’t shared by the rest of the country. But newly released data collected by Fair Vote Canada pokes fairly big holes in Monsef’s talking points. You’d think Monsef would want to show some good data to support her claims rather than randomly pull anecdotal evidence out of thin air? But instead the data suggests the majority of speakers at over two-thirds of electoral reform town halls held across Canada actually advocated for some form of proportional representation. By contrast, the majority of speakers at only 5% of town halls said they want to keep the status quo. And what about this line from Minister Monsef? In fact, 87% of individuals who spoke at electoral reform town halls across Canada advocated for a proportional system. It’s unclear why Monsef can’t recall hearing these speakers – not to mention why she wouldn’t consider nine in 10 speakers to be either a “an overwhelming majority” – but a consensus would likely agree that’s a pretty big number. And what of Monsef’s suggestion that they’ll need to leave the question in the hands of a parliamentary committee because ordinary Canadians can’t make up their minds? Good thing the committee can also rely on the expert testimony of witnesses who appeared before the parliamentary committee on electoral reform. And although Monsef told a town hall attendee that she doesn’t recall hearing many people speak up in favour of proportional representation, FVC says that PR was “the main issue for most” at 14 different town halls the minister personally organized across the country. “They might be in four years,” shouted a woman from the back of the room.